Systemic sclerosis (SSc) is an autoimmune connective tissue disease. The initial symptom in most patients is Raynaud’s phenomenon (RP), a condition characterized by the temporary reduction of blood flow to the fingers and toes (digits) due to a combination of reversible vascular spasms and irreversible alterations of the walls of blood vessels. 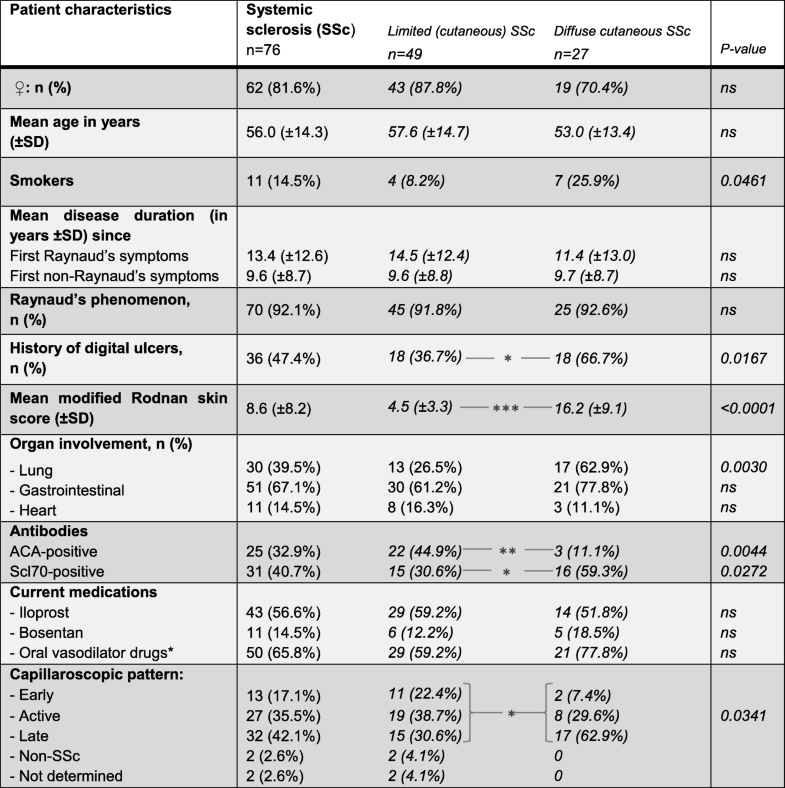 Ultimately, systemic sclerosis leads to ischemic complications such as digital ulcers (DUs) and pitting scars (PS) in 50% of all SSc patients due to micro- and macroangiopathic changes in the vascular walls as well as progressive endothelial dysfunction [1–3]. These complications often result in severe pain, loss of function, inflammation and, occasionally, even amputation. Numerous investigators have attempted to improve the prediction of DU development, and certain risk factors, such as male gender, smoking, autoantibody profile, geographical factors, diffuse subtype, history of DU, early onset of Raynaud’s disease and early first non-RP, have been identified [4–13]. Other research focused on the role of microangiopathy (as presented in nailfold capillaroscopy) [14–20]. 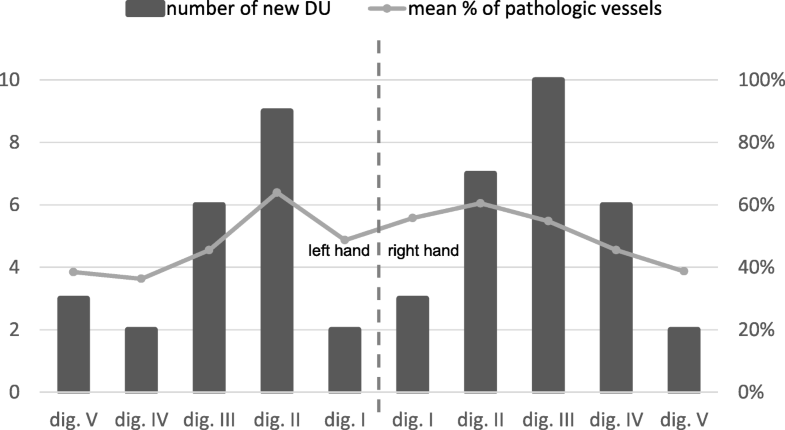 For example, in a multicentre study, it was found that the mean number of capillaries per millimetre in digit III of the dominant hand and clinical signs of severe digital ischemia at baseline have significant associations to new DUs during a 6-month follow-up . Fluorescence optical imaging (FOI) is a relatively new imaging technique, which has mainly been performed in the diagnostics of different arthritides. It depicts the distribution of the fluorophore indocyanine green (ICG) in the tissue of the hands and thereby visualizes the acral microcirculation. In patients with active joint inflammation, a strong signal enhancement of the fluorophore in the affected joints can be observed [25–27]. Recently, our group presented that low or even missing ICG staining was observed in the fingertips of SSc patients with no apparent RP as signs for a perturbed perfusion. These pathologic FOI findings showed associations to present DU and PS in the same finger . 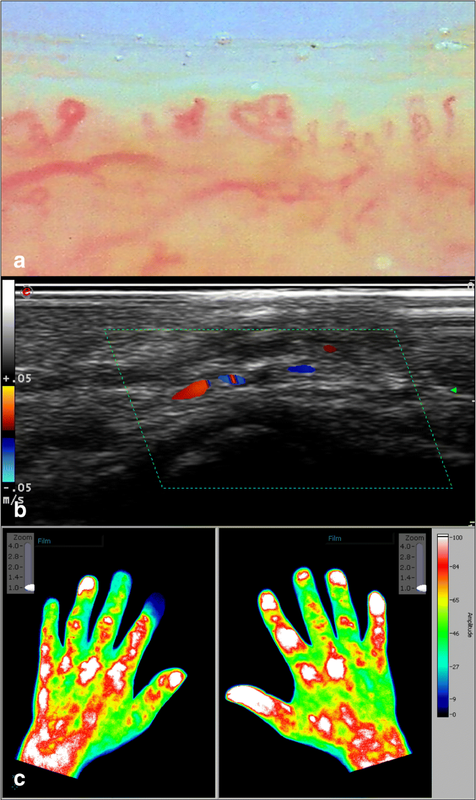 Colour Doppler ultrasonography (CDUS) was conducted using the Mylab Twice device (Esaote, Genoa, Italy) and its linear array probe (9.1 MHz). Patients received a warm hand bath (ca. 38 °C) 5 min prior to the examination to facilitate vasodilation and prevent vasospasms induced by cold temperatures. Thirty-two vessels of the hands (20 proper palmar digital arteries [PPDA], 6 common palmar digital arteries, 2 superficial palmar arches, 2 ulnar arteries, and 2 radial arteries) were analysed and graded as either wide (normal vessels), narrowed or obliterated (pathologically altered vessels), as previously described [22–24]. A shortened examination protocol (the eight proper palmar digital arteries of the right hand’s digits II to V) showed similar associations with present digital ulcers at baseline [23, 24] and was assessed in regard to newly developed digital ulcers as well.